A Boeing Delta 2 booster pierced the night sky Sunday evening, successfully launching the first modernized Global Positioning System satellite to build a bridge from the navigation network of today to the advancements of tomorrow. Following a smooth-as-silk countdown, the blue and white rocket shot off Cape Canaveral's pad 17A at 11:37 p.m. EDT (0337 GMT) trailing a plume of blinding flame. Night owls as far away as Miami spotted the launch. The two-ton GPS 2R-M1 spacecraft rode its three-stage launcher into a temporary, looping orbit stretching from 150 to nearly 11,000 miles where the Delta successfully released its payload nearly 25 minutes after liftoff. Ground controllers will spend the next several days guiding the $75 million satellite to its final destination by firing an onboard kick motor to raise the orbit's low point. The power-generating solar panels will be deployed and antennas unfurled during the critical early days, too. If all goes according to plan, a separate mission control team takes over Friday to commence an extensive four-month test regimen that will put the Lockheed Martin-built satellite through its paces. GPS 2R-M1 begins a new breed of updated GPS satellites that will not only broadcast the navigation signals as previous spacecraft but also provide two new military signals and a second civilian signal. Those improvements promise to bring greater accuracy, added resistance to interference and enhanced performance for users around the world. The advancements for the military will provide warfighters with a more robust jam-resistant signal and enable better targeting of GPS-guided weapons in hostile environments, while the new civilian signal removes navigation errors caused by the Earth's ionosphere. "I think this is a pretty huge step. We have essentially been operating on the original-design signals of GPS for over a decade, and this is going to be the first time we are actually adding new signals from space," said Col. Allan Ballenger, GPS system program director at the Space and Missile Systems Center. "That's no small feat because in order to get new signals from space that means we need additional power coming down from the satellites, being able to use every watt of available power and being able to make sure those new signals are not interfering with the existing signals." Ensuring the new signals do not cause problems will be a key focus during the next four months of on-orbit tests. "One part of our responsibility that we take very seriously is what we call backwards compatibility -- making sure while we are modernizing and adding new signals for both the military and civil customers we're not introducing inadvertent problems for those users out there already with their GPS receivers across many hundreds of thousands of DoD platforms, coalition partner military platforms as well as millions of civil users -- things like OnStar, what's embedded in cell phones as well as automobiles. We want to be very careful to make sure that we don't do anything to (mess) those up," Ballenger said. 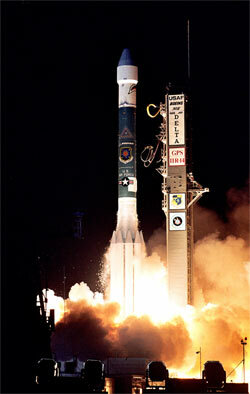 Lockheed Martin has built 21 of the GPS 2R satellites for the Air Force, of which 14 have now launched. Five years ago, the military decided to add the modernization features to the final eight spacecraft in the series. The changes fit within the existing GPS 2R satellite design. The modernized spacecraft weigh 4,545 pounds at launch, only 60 pounds heavier than the earlier model, have a redesigned external antenna panel and higher-power, more-efficient transmitters. The second modernized satellite will be shipped to Cape Canaveral later this year for launch in early 2006. 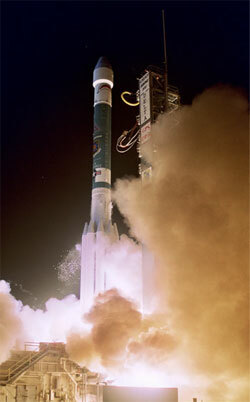 The exact launch date depends on the results of the GPS 2R-M1 testing. The spaceborne network features 24 primary and several backup satellites flying in six orbital groupings. The Air Force began launching the fleet in 1989 and continues to send up new satellites as replacements to keep the navigation system in good health. There are 28 functioning GPS satellites today. 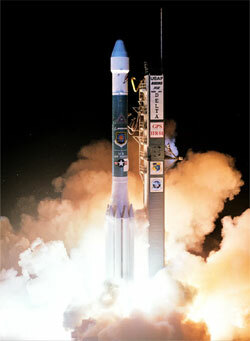 GPS 2R-M1 will assume the Plane C, Slot 4 position, taking over for the GPS 2A-20 craft launched in May 1993. The aging satellite, although still operational, will be repositioned within the GPS constellation for the remainder of its life. The new slot for the old spacecraft will be determined later. The Air Force is expecting to deploy three new GPS satellites next year. Getting multiple modernized spacecraft in orbit is necessary to reap the benefits of the new signals by covering more of the planet at any given time. "At our current projected launch rate, which is between two and four satellites a year, that takes us out some number of years before we actually populate the full constellation. Obviously, one satellite will give you only several hours of coverage to a particular receiver. As we launch more and more satellites, that coverage will improve over time," Ballenger said. "On the military side, we're also looking to modernize user equipment for military users to take advantage of the military code. But that will involve making modifications in ships and tanks and planes." Ballenger said some civilian receivers already on the market can pick up the new signal, while older units will have to be replaced. Millions of people across the globe use GPS every day, and that commercial marketplace for GPS technology has exploded in recent years, growing from $16 billion in 2003 to what analysts predict will be $68 billion in 2010, said Michael Shaw, director of radionavigation and positioning at the U.S. Department of Transportation. "We are seeing continued growth in precision civilian applications such surveying, precision agriculture, infrastructure monitoring, geodesy, as well as volcano and earthquake research. More specifically at the Department of Transportation where I work, we are expanding our applications across the entire U.S. transportation infrastructure," Shaw said. "The bottom line -- GPS is absolutely critical to our nation's economic well being." "We have the most robust and capable global positioning system in the history of space. The navigation and timing signals our GPS satellites provide have changed the face of war, enabling precision operations and more importantly saving lives by helping minimize collatoral damage. GPS has also spurred on an international multi-billion dollar civilan and commercial market for a variety of GPS and timing applications," Ballenger said. Adding more of the new modernized satellites is eagerly awaited, Shaw said. "We are starting on a journey of one satellite at a time." While the new series has just begun to fly, the Air Force has the next generation already in the works. The GPS 2F satellites are under construction at a Boeing plant in California. They will feature the original and the new modernized signals, plus offer a third civilian signal of particular interest to the aviation industry. A dozen of those satellites will be built, with the first launch anticipated in 2007 from the Cape. Sunday's launch was the 53rd for a GPS satellite and the 42nd carried on a Delta 2 rocket. For Boeing's workhorse booster, it marked the 118th successful Delta 2 rocket launch out of 120 flights since 1989 and extended the string of consecutive successes to 65 dating back to 1997. The next Delta 2 rocket launch occurs from California's Vandenberg Air Force Base around October 26 carrying the CloudSat and CALIPSO environmental satellites for NASA. The next Delta 2 from Cape Canaveral will be early next year carrying either GPS 2R-M2 or the MITEX experimental military mission for the Defense Advanced Research Projects Agency.